Marianne Doyle, from left, Ruth Schieltz, Lois Ann Baker and Gail Brandewie were among six ladies honored as living historians for their efforts to preserve local history in a ceremony held Sunday afternoon at the Versailles Area Museum. Shown holding the permanent plaque that will be displayed at the museum is Versailles Area Historical Society Board President Deb Pohl. Also honored were Ruth Pleiman and Juanita Gerling, who were unable to attend. 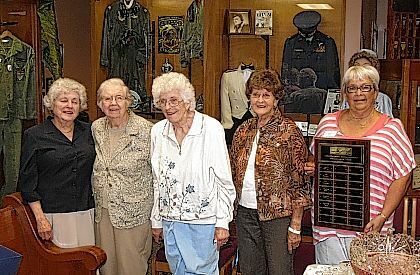 VERSAILLES — May was National Historic Preservation month, and on Sunday, area residents, friends and family members gathered in the military room at the Versailles Area Museum to recognize six ladies who have devoted countless hours of effort to help preserve local history in some way. Honored on Sunday with the inaugural presentation of the “Preservation Award” by the Versailles Area Historical Society were Ruth Ann Pleiman, Marianne (Monnin) Doyle, Gail (Pitsenbarger) Brandewie, Ruth (Wagner) Schieltz, Lois Ann (Judy) Baker and Juanita (Baltes) Gerling. “This year, after talking for so long about taking a moment to recognize people who have helped us preserve and keep our history, we thought for National Preservation Month, what better way to celebrate it than to celebrate those lives who have touched the museum and their communities through preserving our history,” said Jim Kelch, board member of the Versailles Area Historical Society, Sunday. In addition to being honored with certificates and their names engraved on a permanent plaque at the museum, the ladies were surprised with the presentation of citations sent for each by Rep. Jim Buchy and the House of Representatives of the Ohio General Assembly. Kelch noted that for those who are not part of Buchy’s district, he also had their home district representatives sign the certificates. “This has been quite a journey,” said Deb Pohl, president of the historical society board. “We…have started preserving pictures that have been donated to us and also genealogy. And when you talk about genealogy, these ladies come to mind right away. “Gail has started out years ago with her dad and preserving Versailles history,” Pohl continued. “Lois Ann Baker and her sons have done a lot of photography and traipsed through lots and lots of cemeteries. Gerling was unable to attend, but her daughter Marilyn was on hand to accept her mother’s certificates. Pohl noted that Brandewie’s historical video plays in the gift shop during museum hours. “I remember back in 1964, when the first Versailles sesquicentennial book came out, I told my mom I had to have my own copy, because I didn’t even realize back then that I was into history and genealogy, and I didn’t even know it,” Pohl said. “But Lois Ann and whoever helped write that, they started preserving Versailles history.